Can't you see how excited I am? Yay! I finished my Sotherton. Despite my bemused expression, I am really happy with this knit (self-portraiture with my D80's remote is, as yet, unperfected). There were a few modifications (I can't even knit my own pattern "straight"! ), since I chose this beautiful tosh vintage, instead of the tosh dk called for in the pattern. My gauge was a little different, but since I was happy with the fabric I was creating I used the numbers for the 2nd size (I'm really a Medium/third size) for the body and ended up using the smallest size for the sleeves but knitting them much longer thanks to my lanky arms. And I raised the back of the neck about an inch by working a repeat of the twist pattern back-and-forth across the back stitches and then picking up a few stitches at each edge before working the collar ribbing. Don't forget: There's an ongoing Sotherton KAL in my Ravelry group - join us! Isn't that Byzantine colorway lovely? And aren't you proud of me for not knitting a blue sweater for once? After a skein disaster I had on an upcoming pattern, where one sleeve ended up looking more washed out than the rest of the sweater, I alternated skeins on the body of this one and chose the matching-est skeins for the sleeves. In case you're wondering, I ended up ripping out both sleeves on the other pattern, reknitting them alternating skeins, and then reknitting the yoke, also alternating skeins. That was a major bummer, but worth it. Hopefully, you'll see the final product of that agony next week. I'm sending the pattern off to my new tech editor today and hope to have good photos in the next few days, weather and "personnel" (Nick and the girls) permitting. And there are three other patterns with the tech editor. I've been dying to share them, but I've decided that "you never get a second chance to make a first impression" and I love when I release a pattern on Ravelry once it's all ready to go. That way you don't have to wait to buy it, and I don't have to create additional documents like a pre-sell version with specs and swatch information. I like it all in one place, tidy and ready to knit. I hope you agree. OK. Off to work on the other photographed pattern so I can get it to the tech editor ASAP. 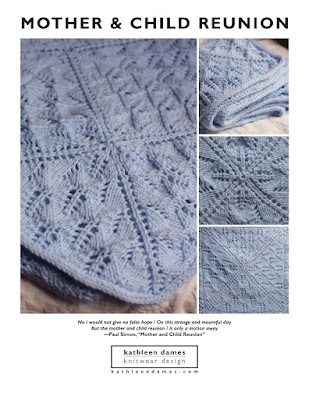 It's in Bartlett Yarns, who will be at Rhinebeck next weekend, so I'd love to release the pattern before I head upstate. But it's a cable doozy, so there are a lot of i's to dot and t's to cross, plus it's the first pattern I've written with a hood. You're going to love it! I love it! What a wonderful color on you!